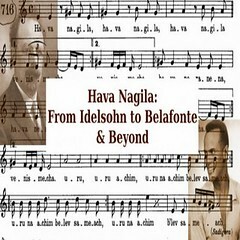 A survey of the history and personalities of an ambitions pre-World War II attempt to create an institution that will document and promote Jewish music while moving the operations from an insecure Europe to Palestine. Based on the archives of the WCJM located at the National Library of Israel in Jerusalem, the book includes useful indices. This is a standard version of the four questions of the Seder, sung in the learning formula of the East European Heder and common among the Hasidim. The first version is in Hebrew only, and the second juxtaposes the Hebrew and the Yiddish versions, phrase by phrase. A collection of anecdotes relating to the Yiddish theater and its star actors. This book includes articles and anecdotes about Yiddish theater. A second edition was published by the National Yiddish Book Center in 2000.